The WAP portal is aimed at first time Internet users and features video tutorials on how to use services such as YouTube, Facebook and Twitter. 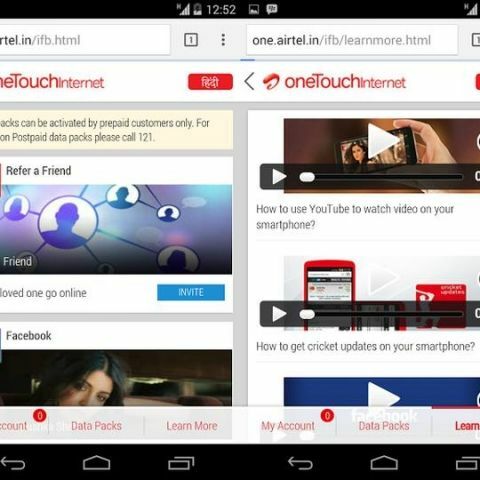 Bharti Airtel has introduced a new initiative called - ‘One Touch Internet’ – targeted at first time Internet users. The new WAP (Wireless Application Protocol) portal allows users to see-try-buy a host of popular services (including social networking, videos, online shopping and travel bookings) through free tutorial videos and trial packs. Airtel's One Touch Internet includes free trial packs and video tutorials for services like Facebook, Twitter, YouTube etc. It also offers subscription to internet packs with ‘My Account’ management: Check balance for TalkTime, data, trial usage etc. The service is available for 2G and 3G Airtel prepaid mobile customers with internet-enabled devices. The One Touch Internet is currently available in English and Hindi languages. Airtel plans to include 8 vernacular languages soon. Airtel prepaid mobile customers can call 111 or visit http://one.airtel.in on their mobile phones’ web browsers to know more about the new initiative. “The Indian telecom market has entered a phase of data led growth. As data networks expand and internet enabled devices become affordable - more and more Indians are getting online on their mobile devices. However, our market research has shown that there are millions of customers across the country who own an internet-ready mobile device and are keen on getting online, but are apprehensive due to reasons like lack of know-how and fear of incurring heavy data charges,” Srinivasan Gopalan, Director – Consumer Business, Bharti Airtel said. Airtel, already the largest telecom operator in the country, is aiming to expand its base in the data segment. According to estimates - India has over 220 million internet users today, of which, about 59% get online over a mobile device. Projected to reach a 385 million by 2017, the smartphone penetration in India is only growing stronger and contributing to a rapidly increasing base of internet users, which is expected to more than double to 480 million by 2017. Also it\'s comparison with grand 2 and moto g.